A ‘Rock and Roll Poster Art’ Show, ft thousands of images spanning the last 50 years of Rock ‘n Roll poster art; from vintage to modern, Artist signings! Poster drops! Special guests! 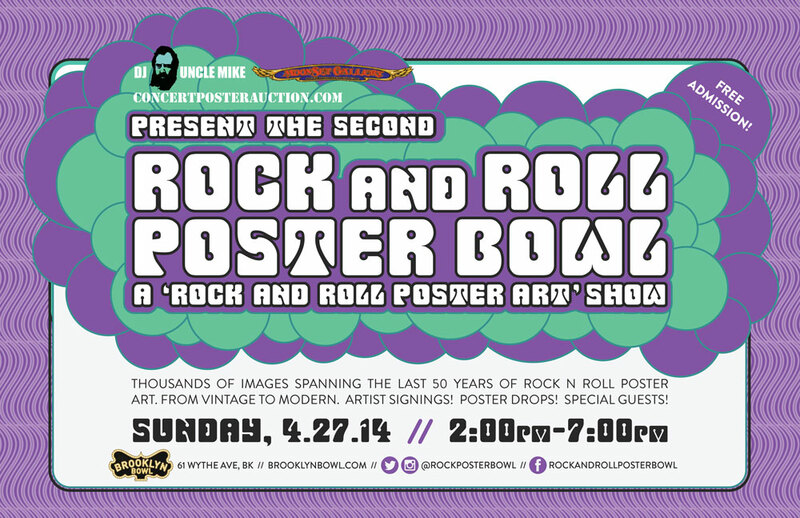 DJ Uncle Mike, Concertposterauction.com and MoonSet Gallery are very pleased to announce the second edition of NYC’s premiere rock art event, the Rock and Roll Poster Bowl! Our debut event in September 2013 was a great success, and we are thrilled to be back in Brooklyn for Round Two! Collectors and casual fans alike are sure to be excited by this year’s lineup, we have rounded up quite an eclectic roster of poster artists and exhibitors. This one-day-only art event and exhibit will happen on Sunday, April 27th at the Brooklyn Bowl in Williamsburg, Brooklyn. Artists in attendance include: Carl Lundgren, Mike King, David Welker, AJ Masthay, John Warner, Just A Jar Design Press, BC Print Media, Mike Dubois, Dan Curran and Bruce Horan. 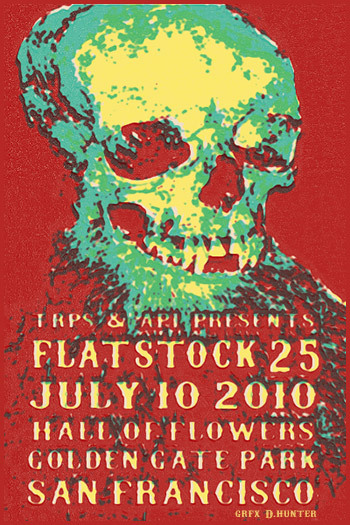 Among them, they have created memorable images for bands such as: The Who, Led Zeppelin, Mc5, Phish, Widespread Panic, The Allman Brothers Band, Grateful Dead, The Roots, Nick Cave, Bad Religion, Soundgarden, Grizzly Bear, Primus, Heartless Bastards, The Black Angels, Bon Iver, Dinosaur, Jr. and many more. In addition to our great lineup of artists, the show will feature exhibits by Moonset Gallery.com, Concertposterauction.com, Carolyn’s Basement, Noiseville, The Gary Grimshaw Estate and more!